In an 8051 microcontroller, it requires 12 cycles of the processor clock for executing a single instruction cycle. For an 8051 microcontroller clocked by a 12MHz crystal, the time taken for executing one instruction cycle is 1µS and it is according to the equation, Time for 1 instruction cycle= 12 /12MHz = 1µS. The shortest instructions will execute in 1µS and other instructions will take 2 or more micro seconds depending up on the size of the instruction. Thus a time delay of any magnitude can be generated by looping suitable instructions a required number of time. Any way, keep one thing in mind that software delay is not very accurate because we cannot exactly predict how much time its takes for executing a single instruction. Generally an instruction will be executed in the theoretical amount of time but some times it may advance or retard due to other reasons. 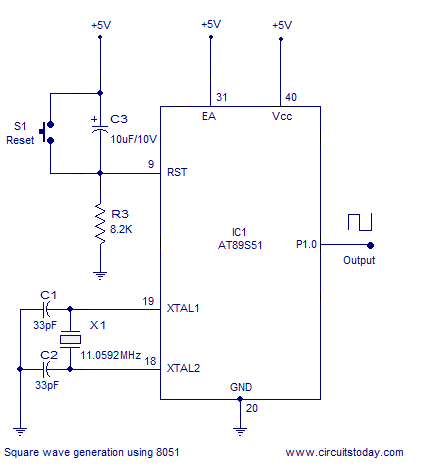 Therefore it is better to use 8051 Timer for generating delay in time critical applications. How ever software delay routines are very easy to develop and well enough for less critical and simple applications. The above program roughly produces a delay of 1mS. The instruction DJNZ Rx,LABEL is a two cycle instruction and it will take 2µS to execute. So repeating this instruction 500 times will generate a delay of 500 x 2µS = 1mS. The program is written as a subroutine and it works this way. When called the sub routine DELAY, Registers R6 and R7 are loaded by 250D. Then DJNZ R6,LABEL1 is executed until R6 becomes zero and then DJNZ R7,LABEL2 is executed until R7 is zero. This creates a loop of DJNZ Rx, LABEL repeating 500 times and the result will be a 1mS delay. As I said earlier, this just a rough delay and when you test this program you may find slight differences in the output. You can make adjustments on the initial values of R6 and R7 to make the result more accurate. Program to delay 1 second. The program shown below produces a delay of around 1 second. In this program subroutine for delaying 1mS (DELAY) is called 4 times back to back and the entire cycle is repeated 250 times. As result, a delay of 4 x 1mS x 250 = 1000mS = 1 second is produced. Square wave generation using 8051. Using software delay subroutines square waves over a wide frequency range (limited by the crystal frequency) can be produced using 8051. The idea is very simple, run a subroutine with delay equal to half the time period of the square wave, complement any port pin after the delay routine is finished, repeat the delay subroutine again, complement the same port pin again and repeat the cycle again and again over time. This will result in a square wave of the required frequency at the corresponding port pin. Circuit diagram for generating square wave using 8051 is shown below. The same circuit can be used for generating any frequency but the program is different. Program for generating 1KHz square wave. Program for generating 2KHz square wave. Program for generating 10KHz square wave.